My Dad has gone by the name of Charlie Brown for over 40 years so it was so appropriate that he was Charlie Brown himself! A year ago he decided it would be a good idea to dress up like the Peanuts gang. We had a blast putting these together and ended up taking first place at the costume contest. Thanks to the great ideas found on this site, we made the Peanut Gang Bobble Heads from scratch. We started the process exactly one week before. Starting earlier may have been a little easier! We used punching balloons as the base and then 3 layers of paper mache. Styrofoam balls cut in half were the ears (hot glued on) and all heads were sprayed using a paint spray gun. The faces were hand painted and the mouths cut. We added black veil to the inside of the mouths and a big piece of foam cut to the shape of the top of each head helped us keep them on more steadily. The hair was made up of felt, pipecleaners and yarn. We each found our clothes either by ordering on-line, in thrift shops or at our local stores. We will treasure these bobble heads! 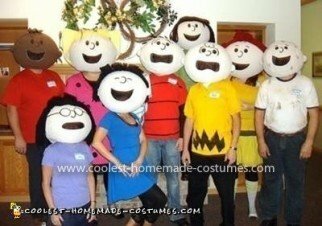 Thanks for looking at our Homemade Peanuts Crew Costume and if you decide to try this, in the end it will be worth the work you put into it. So fun!